In Windows XP, it was extremely easy to undock the QuickLaunch bar from the taskbar and move it anywhere on the screen. 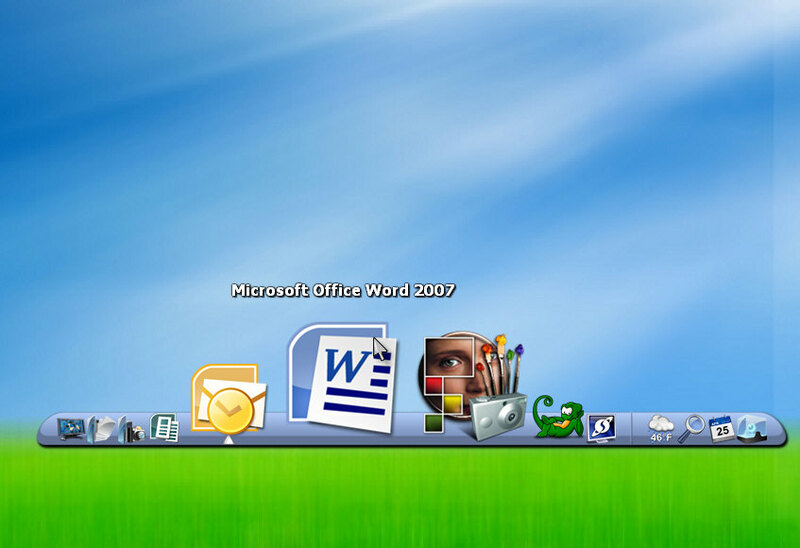 In Windows Vista, it was no longer possible to undock the QuickLaunch bar, but there was a new feature that allowed you to create a docked toolbar from any folder on the computer. Therefore, the quick fix was to create a new folder, drag all of your shortcuts into it and dock it on the bottom of the screen. In Windows 7, however, they’ve done away with that feature, too. Now, there is no native way to dock additional toolbars at all. You only get one toolbar. That’s where ObjectDock comes in. ObjectDock is a nice little utility that allows you to create a new toolbar and dock it at any edge of your screen. Visually, by default, ObjectDock is very similar to the dock you’ll find at the bottom of Mac computers. On the dock, you can add shortcuts to any programs or utilities you frequently use. On top of the standard quicklaunch features, ObjectDock also includes a small indicator that tells you which of the programs on the dock you currently have open. Finally, there are a few widgets that can be used on the dock (called “docklets”), including a weather widget, a clock widget and more. You can download and use a version of ObjectDock for free, which is the version I’m using. However, there is also a very reasonably priced (currently $19.95) premium version that allows you to create multiple docks, to create tabs on the docks to help organize your shortcuts and more. If you’ve recently upgraded to Windows 7, or even if you’re using Vista and you’re looking for a better way to implement a quicklaunch toolbar, I would highly recommend using ObjectDock. RocketDock (http://rocketdock.com/) does exactly the same, for free.